Last of her kind, the lovely Balclutha is a fascinating ship full of history, and has one of the best, most realistic interpretive displays we’ve seen. There are even bags of grain in her cargo hold. Summer has arrived on the old Sockdolager. We’re in Sausalito, right in front of Galilee Harbor, where the contented quacks of a pair of resident jet-black ducks wake us up each morning. Behind us at low tide are visible the bones of an enigmatic old 132-foot brigantine named Galilee. She was built by a famous shipwright in 1891 for the South Seas trade, and later converted to a 3-masted schooner for fishing in Alaska, where her condition deteriorated. In the early 1930s she was bought by a Captain John Quinn, grandfather of our Port Townsend friend and poet Peter Quinn. Captain Quinn and his wife brought the Galilee to Richardson Bay and converted her to their home, the first “house-boat” in Sausalito. They lived aboard her for many years. There were some efforts to preserve her because she qualified for National Historic Landmark status, but her luck ran out and here she lays in a salt marsh, kept company by the ducks, a yellow-crowned night heron, and some crows. Click here for the story and here for a photo of the ship in her sailing days at the turn of the century. A community of houseboats, artists, and, later, hippies, grew up around the Galilee. Colorful houseboats and equally colorful liveaboards are a fixture in Sausalito now. A Bit of Nostalgia: While Jim has been here several times before, the only other time Karen was in Sausalito was in 1976, and she headed straight for the docks. 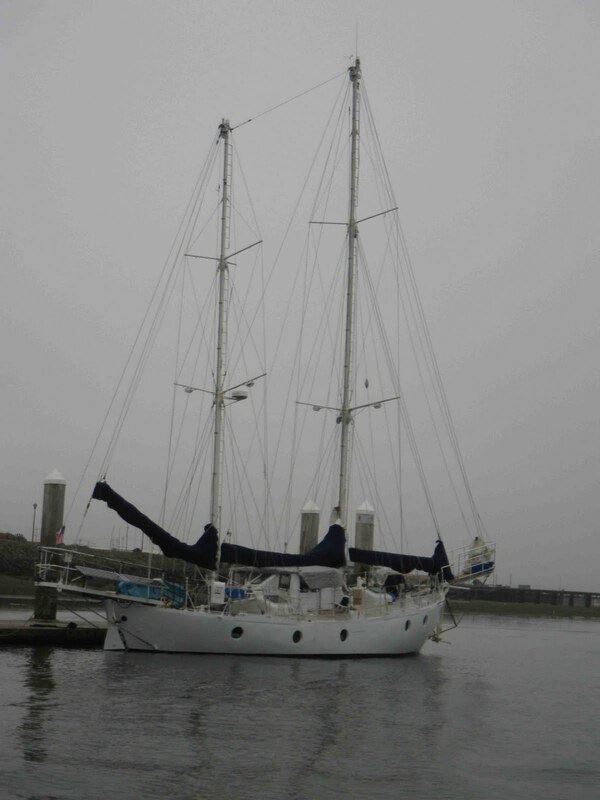 Coming upon a stout seaworthy 28-foot sailboat, she stood quietly admiring it. 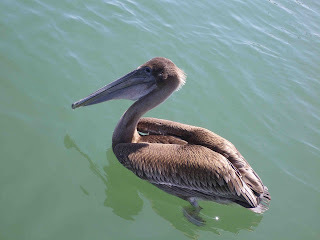 Suddenly the bearded owner popped his head out the companionway, and Karen who was fairly new to sailing at the time, said, “Sorry to have bothered you, I was just enjoying your boat.” The owner smiled and said, “Why don’t you come aboard? Annabelle’s just made cookies and we’re having tea.” Astounded at such friendliness to a perfect stranger, Karen went aboard the good ship Amøbel, and for the next two hours listened to tales of the sea spun by Gordon and Annabelle Yates, who’d just sailed to San Francisco from Europe via the Panama Canal. Holy mackerel, did Karen ever enjoy that. Only much later she realized what mentors this couple had been to sailors whose writings she was reading in books and magazines. Sunrise in Sausalito as seen from our companionway. Summertime, and the Livin’ is Easier: This is the first real summer weather we’ve had in a long time, and wearing T-shirts, shorts and crocs is a novelty. The chilly damp we’ve had up to now had coated everything in the boat with moisture—so much that a spreading glaze of mildew had to be vinegared off the woodwork. It feels good to dry out. We’ve actually rigged an awning for shade! Summer does not seem to have arrived yet across the Bay in San Francisco, but we know where to find it now. Karen is nearly delirious with joy at the sound of palm trees rustling in the wind. Visiting with our Japanese friend Dai, who has solo sailed his Morgan 32 down the coast from Vancouver, and is headed next to Hawaii. Dai makes no secret of his physical handicap, but that hasn’t stopped him. He has also ridden a horse across Japan, and skydived. 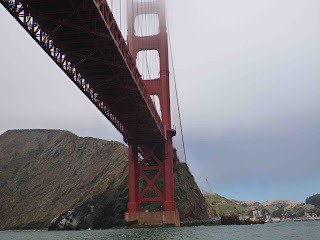 Wonderful San Francisco: Still, the foghorns, cable cars, steep hills, Chinatown, and the fascinating waterfront in San Francisco with its Maritime Museum are not to be missed. We hung onto the side of a cablecar as it went clattering up the hill. No straps, no safety bars, just hang on or you’ll fall off like roadkill—amazing, they don’t protect us from ourselves! “Watch it on the left!” calls the Gripman (driver), as an oncoming truck’s mirror threatens to scrape off a few riders. He’s not kidding, and everyone scrunches in, saying “S’cuse me” to the seated riders we crowd. How is this little thrill still possible in our litigious, safety-crazed world? The Gripman operates a brake lever that makes the cablecar stop by pressing a piece of pine onto the street. Not walnut or teak, they’re too hard and get too smooth, but pine, which stays rough with the friction. Is low tech beautiful, or what. Safety sign for cablecars. Karen is on the middle left. A Mechanic's Hog Heaven: At the top of the hill is what they call the cablecar museum, but really it’s more like Grand Central Station. Here they let you lean over a rail and look down on spinning pulleys, corner gears, and miles of steel cable that run under the streets to pull the cablecars along their routes. You can go down some stairs and see a corner section in operation under the street, too. There are over 10 miles of 1 ¼ inch cable, and it must be replaced every 75-180 days. To make a loop for, say, the Hyde Street run, you need 16,000 feet of cable made into a loop with (please sit down, rigging and tugboat friends) a wire splice that’s NINETY feet long. The whole place hums and smells like hot grease. A Chocoholic's Hog Heaven: Oh yes… do not fail to visit Ghirardelli Square’s shameless tourist-trap chocolate factory, where they hand out little squares of free chocolate at every entrance (and there are FOUR separate entrances, heh heh) where you can slurp down a lifetime’s worth of chocolate dopamine in one frosty Nob Hill Chill. Your waistline won’t thank you, but your brain-freeze-happy taste buds will. Passerby: How long are you going to be out for? Karen: Do you think there will ever come a point when we’re tired of this? Karen: When do you suppose that might that be for you? Jim: Oh, maybe twenty years. Karen makes a pilgrimage to the famous City Lights Booksellers, near Chinatown. It was started and is still owned by the poet Lawrence Ferlinghetti, who once shipped out during World War 2 on one of the “Coastal Picket Force” comandeered private sailboats that patrolled the US east coast for enemy submarines; the coincidence here being that Karen once co-owned the Schooner Windsong, one of those patrol boats. 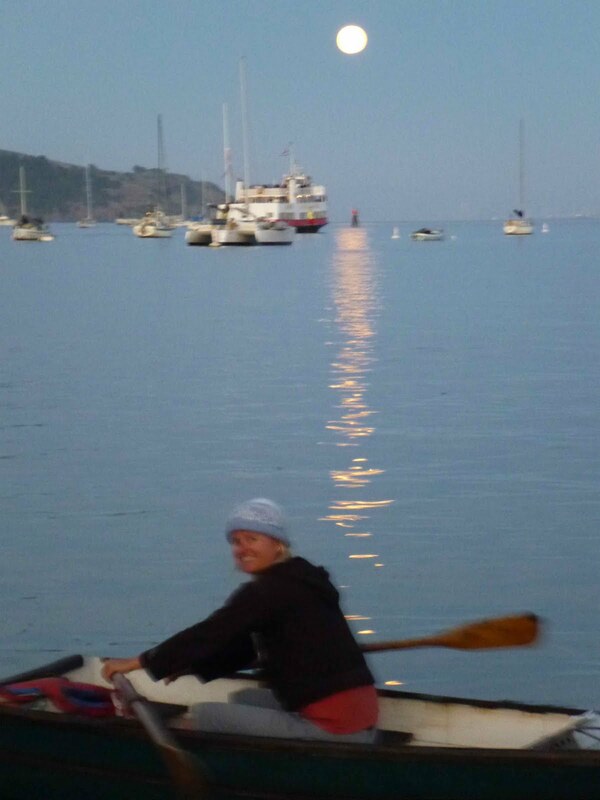 A treat for the senses: Karen’s friend Tilikum R. alerted her to the fact that seven Polynesian double canoes, or vakas, would be sailing into San Francisco from Hawaii, on a 15,000 nautical mile journey to raise awareness of the health of our oceans, especially the Pacific. They're from all over the Pacific. As we watched from the breakwater ashore, the canoes sailed together under the Golden Gate Bridge, the sail colors of five of them matching the Bridge's orangey hues, and if you closed out the other distractions, it was possible to imagine being in another time. We happened to be walking on the beach at Aquatic Park when five of the vakas came sailing in and ran right up onto the sand in front of us! Three of the vakas on the beach. 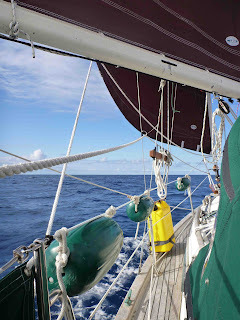 Later, we went aboard the Hine Moana from the Cook Islands for a tour and to help them raise the sails. It was unbelievable how the ship came alive with the sails shaking in the wind. They were happy to take us with them, but since we had no way to get back across the Bay to Sockdolager, we reluctantly got off and watched them sail away. 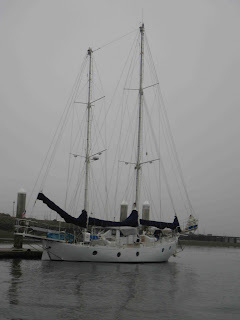 They left for Monterey and points south, and we hope to see them again along the way, including back in Polynesia. Finally, news of Karen’s belted-out rendition of “I Left My Heart in San Francisco” while sailing under the Golden Gate Bridge was well-received. Thanks for the song suggestions for this newly-established tradition for entering harbors. Here are enough to get us a few more miles south, but the rest of you had better get busy. And really finally, everyone needs their very own "Demented Helmsman" photo. The Golden Gate Bridge seen from seaward is a mighty fine sight! 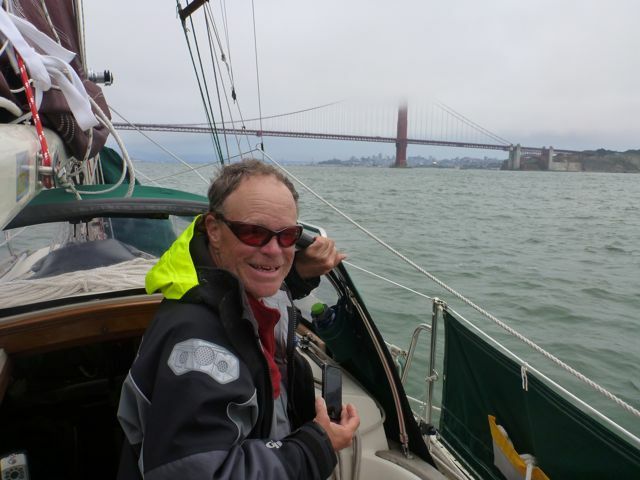 Comparing Notes with a Friend: As we arrived in San Francisco, we were delighted to receive an email from John Guzzwell, who has made several trips down the coast, not to mention sailing around the world. John wrote, and we wholeheartedly confirm, “It can be a bit wild getting down below Cape Mendocino, but the weather moderates after that.” We were amazed to read that one trip down the coast in Trekka had taken him 17 days, which also included a couple days spent hove-to in a gale. (Click here to read that story and more in a clip from Good Old Boat magazine.) John’s description of his first gale at sea and the way the boat handled felt a lot like our own experience. Like John discovered in his gale, we found being hove-to in less than ideal circumstances for two days gave us even more confidence in our little boat. While laying in our bunks as the wind moaned and seas hissed and crashed over us, we were grateful that the rigging, chainplates and hull-to-deck seam caulking were new, and that we’d taken the time to remove and repair the bowsprit a couple winters ago. When each sea that punched the side of the hull shoved us a few more yards to leeward, we took comfort in knowing that Sockdolager’s solid hull had been crafted with care. 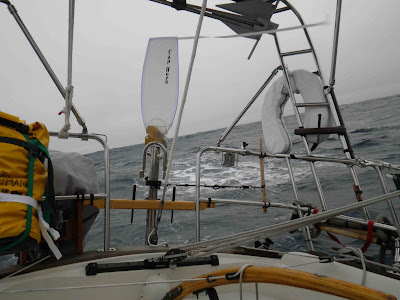 We realized that had we not used the motor for the first and last 8-to-10 hour stretches through calms, and that if we had sailed all the way to San Francisco instead of ducking into Eureka, it might easily have taken us 17 days, too. As it was, the first 600 miles took 8 days, which included about 10 hours of motoring in a calm just west of the Strait of Juan de Fuca, and about 8 hours of motoring to reach the Eureka outer bar before the tide turned and another gale arrived. But if you ask us what we remember best, it’s not the rush to escape the second gale or catch a fair tide at the end of the passage; it’s the exhilaration of being offshore, under sail alone, with all the room in the world and the horizon unbroken by any intrusion, the wind vane steering up, down, through and around big seas for 24 hours a day, and us, once used to the motion, completely immersed in the rhythms of sea and sky. The Advantages of Being an Ex-Teacher: One thing we forgot to mention last time was this little ditty, which happened early one morning while we were 100 miles off the coast of southern Oregon the day before the gale hit. Karen came up for her watch at daybreak and asked Jim, “See any ships?” Nope. “Geez,” she whined, “I almost miss seeing a ship, we haven’t seen one in two days!" Now listen up. NEVER, ever say this unless you mean it. Within one hour, there were nineteen ships in sight. We kid you not. Not one of them registered on the electronic AIS system, either. We had evidently blundered into the secret offshore fishin’ hole for the entire Oregon fleet. 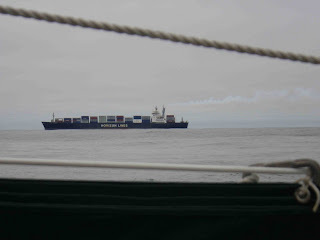 Nineteen large boats were going in every direction, with the largest one coming straight toward us in a zigzag course. 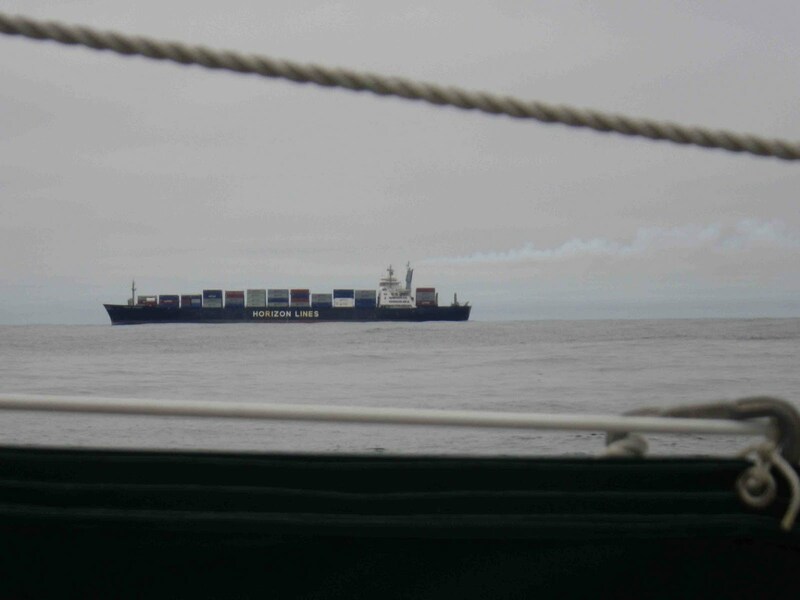 The ship alters course toward us. Let’s try again in a couple more minutes. A tone of polite demand appears in Karen’s voice now, but still they don’t answer, and they’re going to pass closer to us now than before they altered their zig-zaggy course. 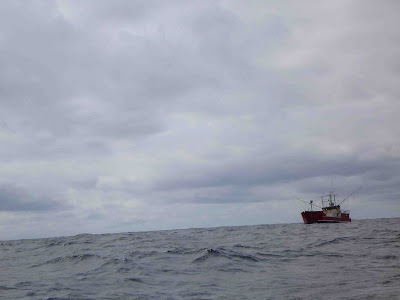 Karen can see they’re not fishing, and suspects that maybe the ship is trying to go astern of us, but it’s going to be too close for comfort, and they aren’t giving away their plan over the radio, either. This means a major sail adjustment fire drill is in our immediate future. Um, Jim,” calls Karen, “Um… there’s a ship…we may have a crossing situation up here soon…” This is another one of those Mars-Venus things where Karen should have been more direct by saying “I need you up here right now!” but she doesn’t want to be harsh because he’s just gone off-watch. So Jim takes her literally, which is to say he figures it’s no biggie. “Don’t wake me up unless you really want me up there!” comes the muffled reply from the sleeping bag. Sheesh, Grumpy and Sleepy all rolled into one lump. “Okay, NEVER MIND then,” says Karen, “But I’m gonna get this guy on the radio, and by the way, there are nineteen ships out here,” she adds peevishly. No reply. 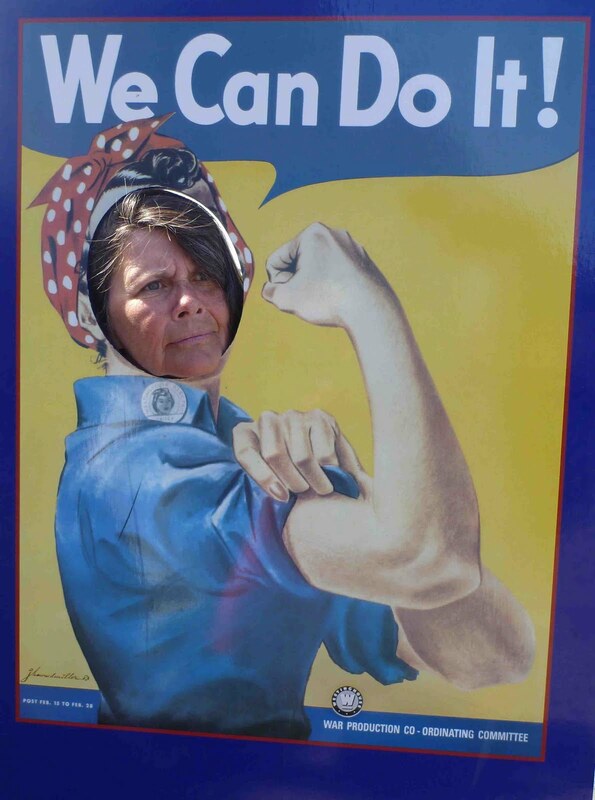 Karen takes this as the most staggering vote of confidence she has ever witnessed, on her seamanship. Whatevs. Here comes the damned ship. Time for some tough talk before going into fire drill mode. She fixes her expression in a red-eyed glare, mashes the transmit button, and engages the Nuclear Option. You don’t use the Nuclear Option near the coast because the Coast Guard’ll jump down your neck, but this is offshore and we’re runnin’ with the big dogs here. The Nuclear Option is the voice Karen once used as a seventh-grade science teacher to reach the sluggard in the back of the room who was wadding spitballs: “HEY! RED HULLED SHIP HEADED TOWARD THE SMALL SAILBOAT UNDER SAIL! YEAH, I’M TAWKIN’ TA YOU! WHAT ARE YOUR INTENTIONS?” Say dishonorable and I’ll run ya through, she thought. Huh? I’ll miss ya? Are you kidding? 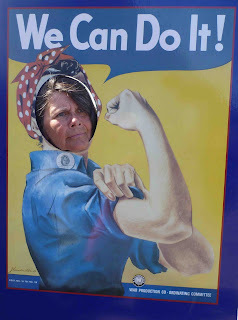 Karen wanted to say, “Wish I could say the same after we’re done, buddy,” but instead roared “EZ-ONE, DO YOU INTEND TO PASS AHEAD OR ASTERN OF US?” in the most perfect ragin’ teacher-ese. “I’ll gobehindja,” said the obviously terrified captain of EZ-One. Guess we showed him. Anyway, passage through the remainder of the fleet, all of whom were busily trawling with nets, was uneventful. Every one of them gave us an exceptionally wide berth, except for a boat that cruised by at a respectable distance trying to peer at the teacher behind at the helm. Some other ships pass pretty close, too. We sometimes call ships if they’re going to pass close, to make sure they’ve seen us. Sometimes we chat, and they give us weather reports. Sometimes they’re grumps. 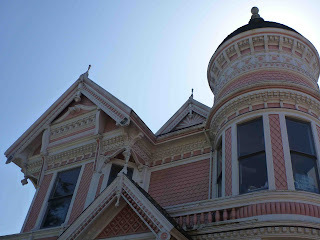 The Pleasures of Ports: In Eureka we explored the town’s excellent history museum and Victorian architecture. Eureka, like Port Townsend, is a Victorian seaport, but it has a very different flavor from PT. Jim caught some Dungeness crabs for a feast, and down the dock we met a young couple named Peter and Molly, who with their seven children, are living aboard a massive Colin Archer steel ketch named Nadejda. They’ve left farm life behind and will, we hope, rendezvous for a musical jam session somewhere in the Sea of Cortez this winter. Nadejda means ‘hope’ in Russian. We’ve traded 49 degrees latitude for 38, and eagles for pelicans. 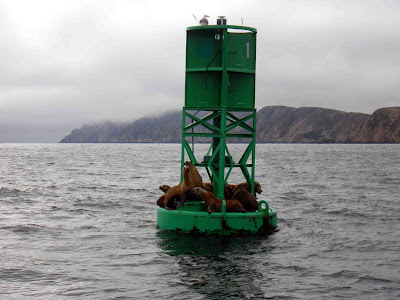 Eureka to Point Reyes: The second passage of 250 miles (Eureka to Point Reyes) took 2 ½ days and included about 5 hours of motoring to clear the harbor, and in the light winds, to get sea room for rounding Cape Mendocino, which we passed uneventfully. After that it was fine sailing for awhile, then back to cold fog. We never did see the coastline until landfall at Point Reyes. What landfall looks like at Point Reyes in calm conditions. Drake’s Bay is on the other side of these cliffs. When the wind died on the last day, we decided not to wait and again motored several more hours. Good thing we did, too. That afternoon the wind began to rise just as we anchored in Drake’s Bay. Since it’s a big bay with a lot of fetch, we set out a second anchor and lots of scope (rope ratio to depth, for landlubbers.) The gale arrived a couple hours later, a good 40 knots in gusts, and it felt just like being underway again. We were comfortable and warm, but had hoped to go ashore to beachcomb and hike instead. 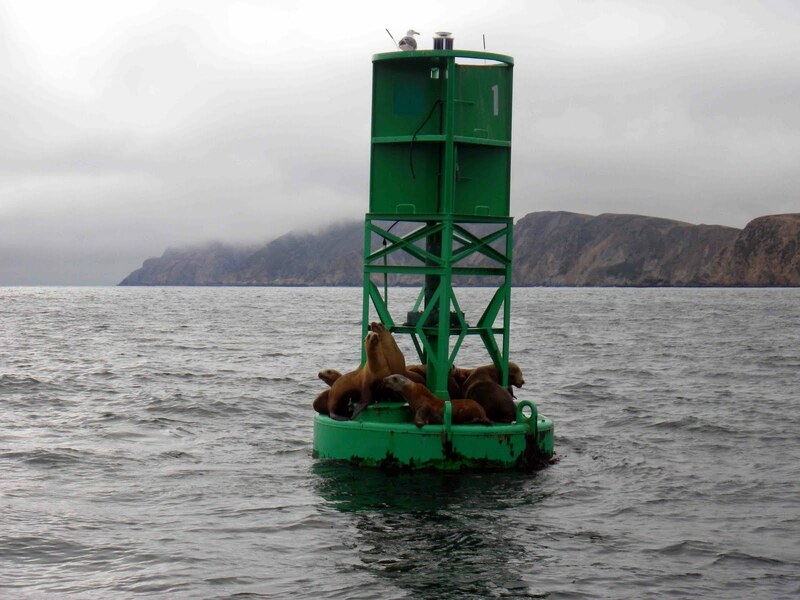 Sea lions sunbathing on one of their favorite kinds of spas. 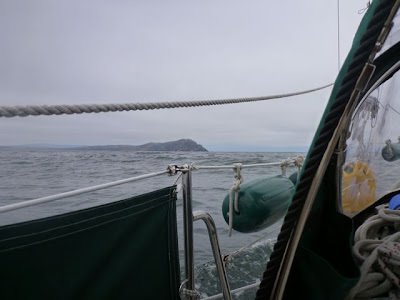 The last 33 miles from Point Reyes to San Francisco Bay’s Angel Island took about 8 hours of motor-sailing in a calm that had followed a third gale that we’d ridden out under two anchors in Drake’s Bay. And when we got under the Golden Gate Bridge, hoo boy did the wind blow! It funnels through there and gets honking at 25-30 knots each afternoon. The folkboat fleet that races here has NO reef points in their sails. They never, ever reef. Wow. Editor Rich Hazleton of 48 North magazine emailed us, saying “You’ll soon be laughing at 30 knot winds.” Yeesh. 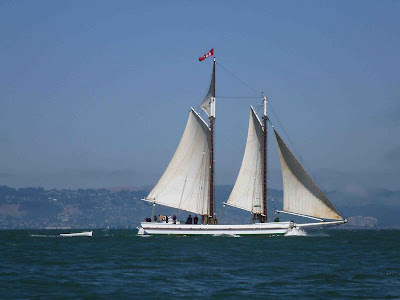 After a week in San Francisco and a few days in Sausalito, we’ll explore other parts of the Bay; perhaps sail up rivers to Petaluma and Napa. Wine country by boat—what’s not to like? We may also go to Alameda or Berkeley before heading out to sea again. By the way, watch for an article on our last big blog post about the passage offshore, in the September issue of 48 North. On Boat Speed: Some of you have wondered what took us so long to get down the coast; others complimented us on a fast passage. This would be a good time to talk about boat speed. 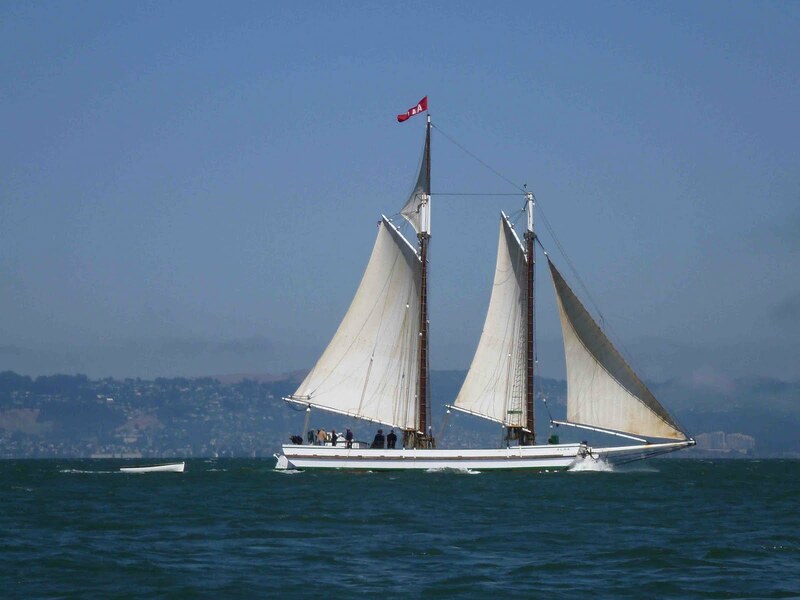 This is Alma, San Francisco's last surviving scow schooner from the 1800s. With that sqaure bow she's not very weatherly, but she can go places with huge loads of cargo that deep-draft vessels can't. Everything in boat design is a tradeoff of some kind. A sailboat’s speed is determined by a lot of factors, the dominant ones being displacement and waterline length. Sockdolager is fairly heavy displacement (good for carrying supplies) and has a waterline length that’s shorter than most cruising boats: only 21 feet, five inches. But she can still make remarkably good time on passage with the wind vane doing the steering. We found that offshore it’s much more comfortable if we don’t press the boat too hard, which means sacrificing a bit of speed for easier motion. An average of 100 miles a day under sail is what we used for passage planning purposes, and it’s worked out pretty good so far. John Guzzwell told us in his email that on one trip from Neah Bay to San Francisco, aboard his fast cold-molded sloop Endangered Species, he took 4 days. You read that right, 4 days. But the thing that made us smile most was this: “Congratulations on breaking away from the dock, that is the hardest part!” Amen, brother. When you’ve been at sea in cold fog, big winds and not much sun for awhile, this is a welcome sight—not just the Golden Gate bridge, but the unstoppable grins, too. Sailing under the Golden Gate was just as much fun as we thought it’d be. 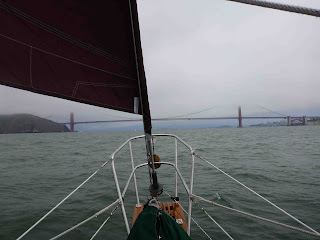 Karen stood on the foredeck and belted out a snappy version of “I left my hearrrrrrt in San Franciscoooooooo” as we passed under the bridge, hopefully setting a jazzy new precedent for entering harbors from now on. We may need suggestions for future musical titles—for instance, no songs have yet come to mind that would properly commemorate entering Santa Cruz, Santa Barbara, or Monterey, so get busy. We spent the last 24 hours in the company of Jamis and Margaret M., some old sailing friends of Karen’s, who took us up to their secluded mountain lair (really, it’s a genuine lair) in Woodside, where a genuine zebra roams and grazes their meadows along with tiny burros and a couple of large emus. They treated us to great food, walks and conversation--if you are ever in Woodside, do not fail to stop and eat at their excellent Buck's restaurant, a local landmark. Going to spend the rest of this week at the San Francisco Marina downtown as guests of new friend and fellow Dana 24 owner Chad S., and then head over to Sausalito to meet up with Di, another cruising friend from Japan who has been singlehanding his 31' boat down from Washington. 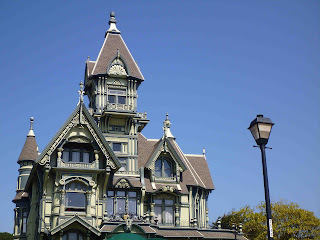 After that we plan to go to Berkeley and maybe up to the Napa area. There’ll be a longer blog post soon with more stories and photos. We are very happily anchored off Angel Island in San Fricisco Bay! Sunny, cool, and beautiful.